This is Dakota performing a “boneless hand varial” at the Alice Springs Skateboarding Titles: The skill of some skaters is exceeded only by the quirkiness of the names they give to their tricks. Matty Day, the local representative of Skateboarding Australia, which hosted the event, says 30 competitors vied for three titles: 11 and under won by James Whitby; 15 & under by Joe Hurley and open by Rowley Hill. It’s the first time that titles were held here although Alice previously had many competitions, skate jams and best trick contests. Whitby, aged 9, turned up without a skateboard, borrowed one and a helmet, and received a brand new skateboard as the prize for winning his category. Later the Aboriginal boy eloquently thanked the older boys in the local skateboarding fraternity for looking after him and teaching him tricks, says Day. 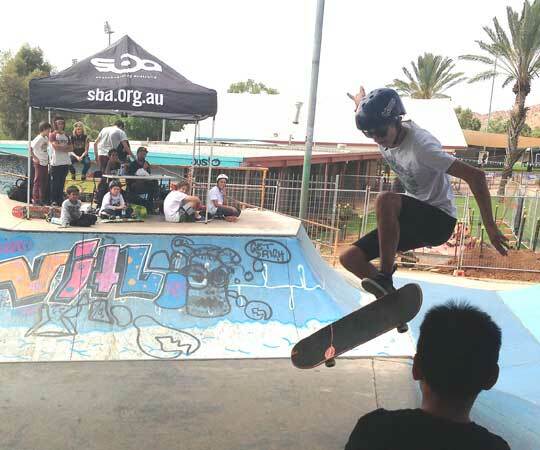 The event was sponsored by Nike SB and the Valour Skate Shop in Alice Springs. Skater Logan Williams, who suffered two broken legs in the recent car accident near Glen Helen, took himself from the hospital to the skate park in a wheelchair and assisted Day in the judging. “He is in great spirits and wanted to be part of the titles,” says Day. And warmest congratulations to Rowley Hill. It is so good to see you hanging in and doing what you do. I’m putting your back page photo up on my board. I popped down to have a look and was really impressed by the support, encouragement and respect that the competitors had for each other. Skateboarding is an outlet that is physical, technical and creative. Mastering the art requires dedication, loads of practice, fitness, commitment, creative flair and a perfectionist streak. All these qualities were on display on Saturday. Young James, winner of the 11-and-under category, stole the show with his humble acceptance speech. Congrats Matty and Alice Springs skateboarders on a successful and inclusive event.